Choosing the appropriate bin size is important. Overloading your bin can cause you to exceed the weight limit and incur additional fees. If there is material hanging over the sides, and the bin cannot be picked up, you can be charged a trip fee and have to off-load some of the debris. For large demolition projects that require concrete disposal or removing heavy things, the weight adds up quickly. In most locations, there is a legal weight limit for transport on the roadways. You may need to schedule an empty-and-return service depending on the scope of your job. 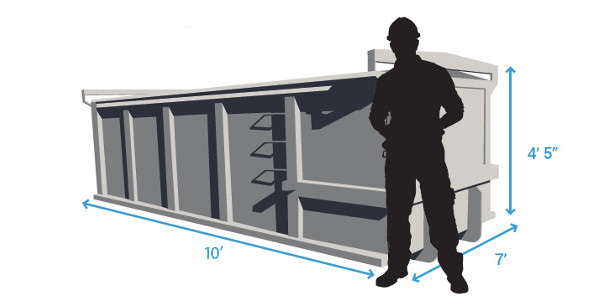 To research the right bin for your project, use our weight size calculators to identify what weight capacity you need. 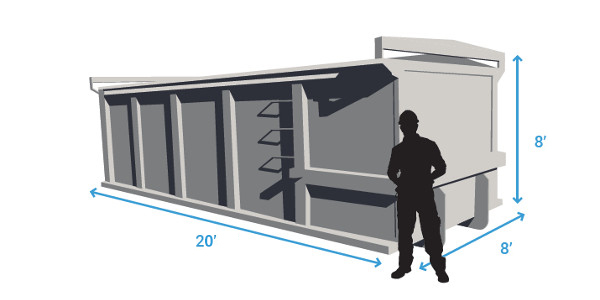 Browse our dumpster size chart and available options below. 6 feet long x 3.5 feet wide x 4 feet tall. Generally suited for small volume businesses, such as offices with less than 20 employees and restaurants serving roughly 100 customers a day. 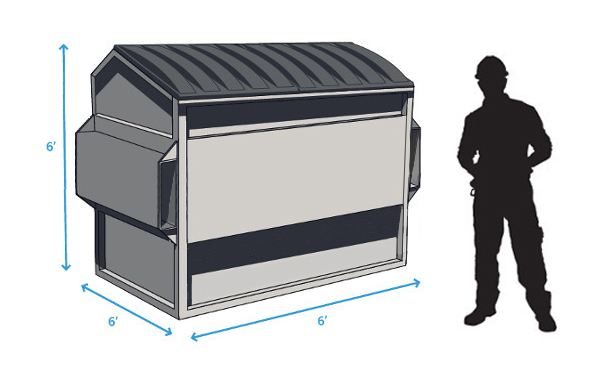 Front load bins in this size are easily placed on properties of any size. 6 feet long x 4.5 feet wide x 4 feet tall. Designed for medium-sized businesses, including companies with up to 100 employees. Retailers, entertainment venues and offices occupying less than 5,000 square feet are well served with this bin size. 6 feet long x 6 feet wide x 5 feet tall. Designed to accommodate schools, retail spaces of up to 10,000 square feet in size, as well as office spaces occupying up to 15,000 square feet. 6 feet long x 6 feet wide x 6 feet tall. 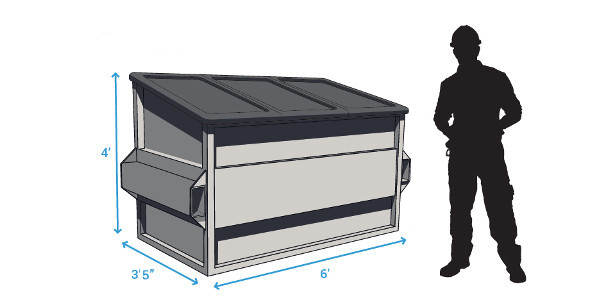 This is the largest front load bin available for apartment complexes, hotels and other businesses. These bins are typically used by large wholesalers and retailers occupying up to 25,000 square feet. 10 feet long x 7 feet wide x 4.5 feet tall. Designed for small-scale projects. 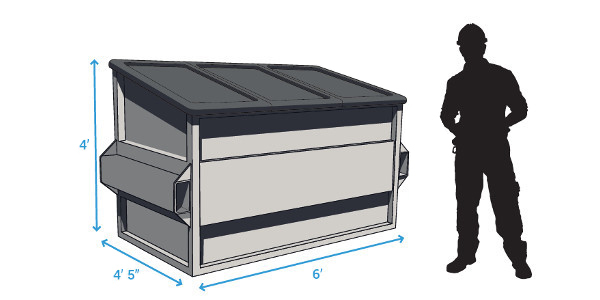 This bin size provides a quick waste removal solution for garage, basement and other home spring cleaning. This size is also suitable for small landscaping or renovation projects. 12 feet long x 7 feet wide x 6 feet tall. Designed for mid-sized projects. Ideal for hauling away debris from a basic remodeling or renovation projects. 16 feet long x 8 feet wide x 4 feet tall. 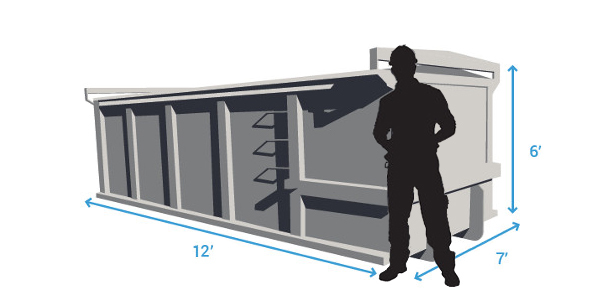 This bin size is a convenient waste removal option for a wide variety of common remodeling and renovation projects. 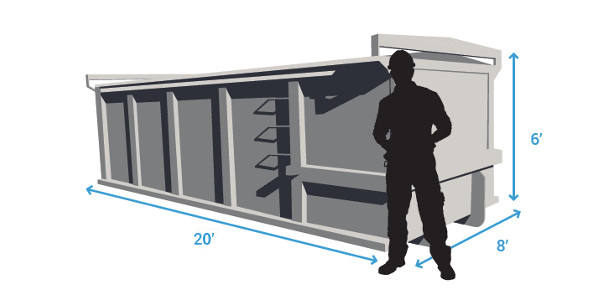 You can use this size for anything from home building to keeping your job site clear of debris. 20 feet long x 8 feet wide x 6 feet tall. Built to handle a range of projects that come with a large amount of debris. Commonly used by general contractor, light commercial and/or industrial projects. 20 feet long x 8 feet wide x 8 feet tall. 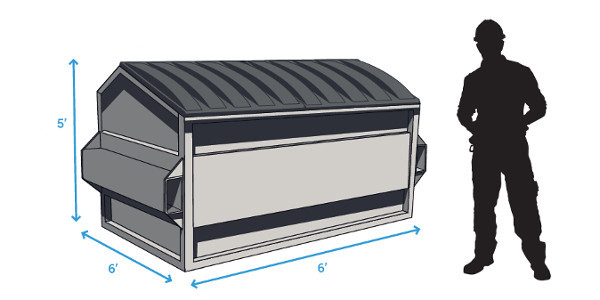 This large roll off bin is best suited for waste removal for projects with a high volume of debris. Use for large construction and industrial projects, demolition, multi-room remodeling or other significant home renovations. Where would you like the roll-off bin placed? For example, driveway, curbside, by front door, etc. Is there anything else our drivers should know, such as security clearances, obstacles, desired services times, site access hours, etc.